What does the group really want in this moment? 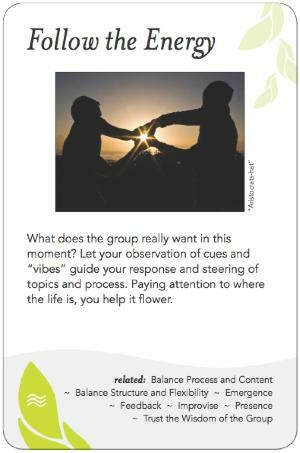 Let your observation of cues and "vibes" guide your response and steering of topics and process. Paying attention to where the life is, you help it flower. As the leader of a group you might have ideas about where you expect the group to go. Perhaps you spent many hours preparing a careful agenda ahead. Then you arrive and something unexpected happens: some event the night before changes the whole scenario, or it turns out the real issue on people's minds isn't what you thought, or a new possibility comes up mid-session that suddenly begs to be considered. These are some of the key times when whoever is leading needs to rapidly assess the situation and make a judgment call as to how to proceed. Much of the skill here is in striking the balance of flexibility in a structure, based on gathering information directly or indirectly about what a group is needing. The most common direct ways are taking a straw poll (show of hands) or simply asking the group and hearing replies from one or more people (and looking for nods and murmurs from others in response). Indirectly, information comes through body language, tone of voice, intuition, and other nonverbal signals, and occasionally via intrusions from the outside world. In addition to tuning into the group, you need to tune into yourself as information comes through you too (see Letting Go). If you are feeling tired, that might be because you didn't get enough sleep the night before, or it might be that the whole group needs a break even though one wasn't scheduled at this time. Part of this pattern is about following the friction and what is alive in the room, but conversely you need to beware of only following the squeaky wheel. If a potential new agenda topic comes up, is it one person's concern or is it held more widely? Use your tools to check in with the group to see what is alive to talk about. If it isn't safe to speak to what is alive, see if you can shift that using appropriate techniques (see Naming). This pattern also helps guide how meeting agendas are set. It's important that meetings talk about the right thing at the right time with the right people, and be willing to modify the agenda (even in the moment) to suit the needs of the people present. If you can successfully plan an agenda that fits where people's natural energy is anyway, it will be much easier to facilitate than if you are pushing upstream. For example, in the period after lunch when many people are tired, you might choose something lively and interactive, rather than data droning on (which will help put people to sleep) or the most important decision of the day (at a time when people are unlikely to bring their clearest thinking to it). As you make judgment calls in the moment, you also need to think beyond what's alive now in the room to consider how the rest of the session may unfold. The energy might be there to open a can of worms, but will it work logistically? Following the energy might lead to running over-time, so consider how that will work out. If you are seeing the energy but not a clear path or enough time for following it, then simply Naming what are you seeing is often sufficient to help the energy feel more at ease. Be aware of the group's culture and comfort level with flexing. Do they have the ability to change tracks? How far is the group willing to go with this? Power dynamics in a group will influence people's ability to be transparent about where their energy really is. It may not be safe in many groups to directly reveal the energy because of potential conflict. The Dynamic Facilitation method created by Jim Rough uses Follow the Energy as its core organizing principle. There is no agenda and very little structure. The participants meet in one full group. People take turns addressing the group as guided by the facilitator, who attempts to choose speakers based on where the strongest energy in the group is (not necessarily the loudest). Participant comments are scribed by the facilitator onto 4 different flipcharts: Inquiries (aka Problems), Solutions, Concerns, and Data. Unlike more linear methods, people are not limited to waiting on potential solutions until the problem is fully outlined, nor criteria for a successful solution established; rather, it all comes out in a natural mish-mash. As people's energy and thinking is fully welcomed where it is and not pushed into rigid channels, something about the process tends to open up new, creative possibilities. In Open Space, everyone present is invited to "take responsibility for what you love." Sessions are convened around personal passions of the moment, and people move from session to session based on where their passion takes them. Thus Following the Energy is central to this method. Tree Bressen's Formats page lists more than two dozen different ways for groups to interact, from small groups and fishbowls to theater and art. She also has a piece called Checking for Agreement that lists a bunch of the direct ways of gathering feedback from the group.